KK: The Wooden Bridge Museum... the site is a very deep mountain with a small village. The main industry of the village is forest products and as the forest industry of Japan is getting worse and worse so they develop some new designs which activates the new forest industries. It is a good example of the use of wood for bigger structures and is kind of a demonstration. 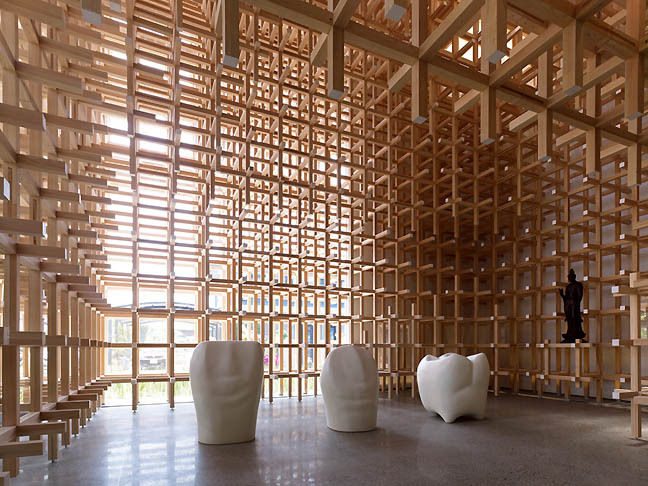 It is also a new cultural space and kind of big challenge for wooden structures. People got many new hints from this structure since it is a very new use of wood. JJ: It is daring and breathtaking... a kind of a stunt like an acrobat, whereas from what Ive seen of the Japanese Garden designs it will be very serene. BB: Yes, but as you can imagine much of what we originally proposed has changed as we have grown to understand the site and information has gotten more specific. Some things are evolving as we understand the tectonics, materiality but the passion about detail will still be there. It will just take a slightly different form from what was shown in summer 2010 which was really just a speculation and a demonstration of our passion about the project and our care for a method of approach. What we hope will be seen is something that is actually far better than was shown in 2010. JJ: That same lattice for the Wooden Bridge Museum and the Japanese Garden was used early on in one of my favorite projects, the dental museum. JJ: it has that fantastic interior/exterior, horizontal and vertical drama that is both serene. It is a very impressive lattice. How did that come about? KK: That is a 3 dimensional lattice structure that started in Kasugai already 10 years ago and we were asked to do a small temple. We studied the joinery of japan and there is this Cidori toy comprised of joinery systems that have been passed from generation to generation in a town called Hida Takayama, which is also an important historical place in Japan for craftsmen. Then we translated that system to a full sized space. It is a 10 meters high building and was very successful. JJ: I like how it brings in he outside as a kind of interior matrix, somehow your buildings reveal the site... they dont just occupy the site like most do. 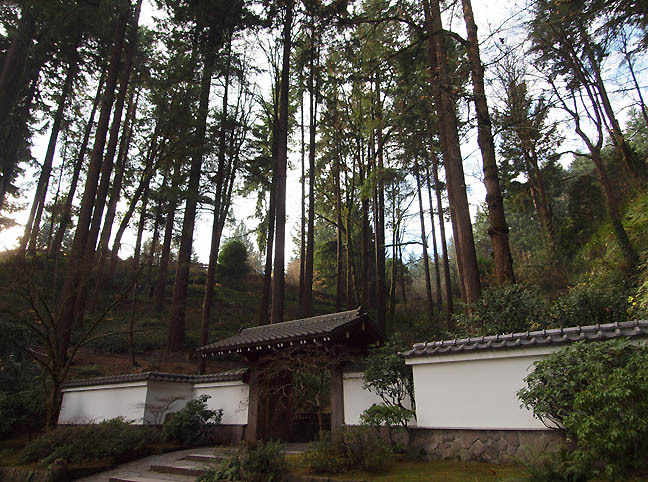 KK: I like the location of the Japanese Gardens in Portland... it reminds me of a Satoyama. Sato means a village and Yama means a mountain so the meaning is village mountain. In Japan we don't want the village in the plain because if the village is next to the mountain it is protected by nature. In the center of the plain the people do not get a sense of being protected so just beside the mountain it is very comfortable. This mountain is called Washington park? KK: This West Hills part of town is very similar to the Satoyama relationship so the location of the Japanese gardens is perfect. The one who chose the site, Dr. Tono, perfectly understood the Japanese culture. JJ: It seems like this project will bring a greater awareness of Portland as a a city nestled into a forested mountain range. We mostly call them the West Hills but they are technically the Tualatin Mountains according to geologists. The project will certainly be an interesting moment of reassessment in much the same way the East Bank esplanade allowed Portlanders a way to get closer access to the Willamette river. The difference is this is a world class amenity and will effect visitors and those living here. We often think of cities as buildings but what the really are is an aggregation of people using a site and its why your architecture is sublime, it is so sensitive to the site. Can you speak about how the Japanese Garden project began? KK: Before the competition I was invited to give lectures at the Japaneses Gardens then later in 2010 we were invited to a competition. A total of four firms submitted and we were selected in December that year. Also, the reason I participated is I was so impressed with the beauty of the Japanese Gardens here. Before I visited here I visited several gardens outside of Japan and generally my impressions of those gardens was not so good because they were strange translations of Japanese Garden but as I walked in these in Portland I was surprised at the beauty. It is a very interesting combination of the local landscape with the big trees 30-40 meters with the human scale of the Japanese Gardens. In the ground areas there is a walking experience but also as we look up there is a verticality that is also amazing. This was my first experience and then I was so excited to participate in this project. JJ: Even though the garden is tucked up way into the hills it is a busy place. Partly this is because it is just above the International Rose Garden and the Zoo is nearby. So the Japanese Garden receives a great deal of traffic as a kind of showcase of natural amenities. This is exciting to me because you are known for your connective spaces and your expansion would further knit the area together... to access the garden one has to climb in elevation through an interstitial path... you really do ascend into the trees in a way that the rose garden definitely does not. How does your design enhance and honor the site? KK: The climbing is a sequence from the old gate at the bottom to a car drop at the top, all should be part of the garden I think. The idea is to integrate the parking at the lower gate and create a plaza and cafe at what is now the main entrance. There are ways to integrate those experiences and people will probably feel as though the garden has become doubled compared to how it was before. Right now they have some interesting elements at the bottom gate area of the garden but they are not well used as a part of the gardens so the basic idea is one of integration. And for Japanese Gardens especially these Japanese Gardens, which are on a mountainside. Also, that kind of a vertical experience is very important. For example the core essential lines are all sitting in the beautiful mountain and the the sides are very deep so they can experience that from the new entrance and we can translate those designs to the courtyard. That means we can integrate the car transportation into the quiet walking experience of the Japanese garden. The Japanese Garden is a spiritual experience but Americans are a transportation culture so the approach for the area between the plaza and the parking lot can become integrated. JJ: You have a gift for translation zones between cultures and eras partly because though you are Japanese you also studied at Columbia, which also lead to you becoming a kind of innovative torch bearer for some very traditional Japanese design ideas that are updated to the present. Right now the hillside is more of hike and one doesn't sense the garden too much until you reach the main gate. Before you were announced as the winner of the competition I was concerned that any design might make concession to the frequent rains of that vertical interstitial zone and become covered? I wasn't very worried about what you might do, you are pretty much the bast case scenario for an architect. KK: I think a covered roof would destroy the beauty of the sequence. The idea around our design is so the gate can give a sense of arrival to the special space as a passage after the car drop and after the rise in elevation the cafe will play an important role in the total sequence as people will walk past its side. The cafe building is reminiscent of the Kiyomizu temple in Kyoto. The Kiyomizu temple in Kyoto is sitting on a cliff and that style is called the Kake style. And the cafe is sitting on a a steep hill so it refers to some designs that have come before and those walking up will experience it's verticality atop the hill. The cafe will be beside the attractions of the garden but just before them there will new spaces near the car drop off. In the drop off area we are designing the village-like space. The small buildings that are gathered together will create an intimate kind of courtyard. But it is not a courtyard in the way western definitions are applied. It is very different from a plaza. The shape of the courtyard is more random and goes in three directions and the village is designed to be an in between space between nature and the artificial gardens. JJ: Does that cluster of village buildings include the cafe? I understand there will be some flexible spaces as well as for programs like classrooms and exhibitions? KK: exactly and this is a new function of the Japanese garden. 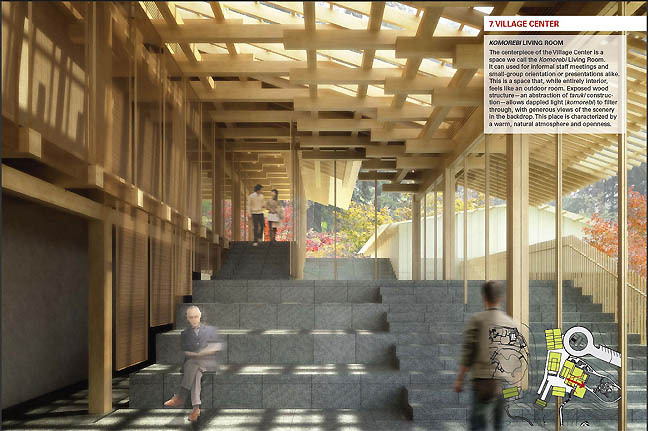 Now the Japanese Garden has an sometime exhibition space that shares its program, but with the addition of the cafe, education, specific places for eating and a store these sub functions, which are not sub functions but main functions can be much more than before. JJ: Right, because Portland's Japanese garden isn't really just plants or an assiduously cultivated outdoor space like in Japan... here it serves a s a cultural exchange where painting, poetry and events like tea ceremonies take place. It wasn't just plantings for a private or royal villa, but as a public amenity. The buildings here would necessarily have a program involved with the spaces. Your design would develop the individual functions into full time organs of the institution. KK: Basically the Japanese gardens in Japan is just a garden and has no additional function, or cultural like this one's. Some Japanese Gardens have stores but they are not so beautiful and are very small. But here if you have the village near the entrance area with those kinds of spaces it make way for every Japanese Garden to have those kinds of spaces. JJ: So Portland's garden would be an innovation and a new model? KK: Exactly, it will be the new model type for every Japanese Garden. So some gardens in Japan will come to Portland to learn what is the future style of Japanese Garden. JJ: That's very exciting, I'm a huge fan of Japanese culture and specifically the way your buildings have taken the traditional and made it a living breathing contemporary practice. 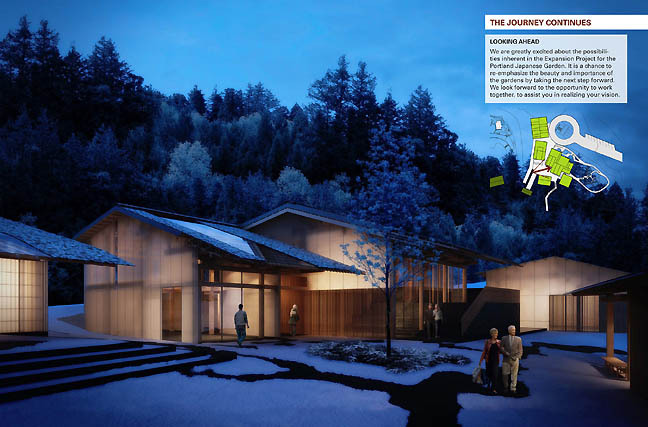 Can you speak to the differences between a personal residence and a more public space as it seems like this project is integrating the two, essentially creating a small community on the side of the mountain? 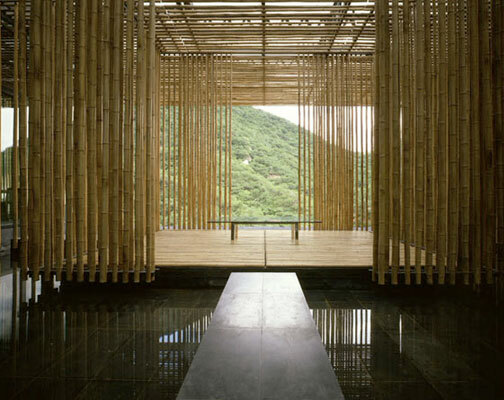 For example in the Lotus house you transmuted stone into a hanging screen that behave like lotus pedals... it is a private residence but it seems like you've found a way to bring that to this public project. More specifically, do you have a similar device to intone the verticality of the site and what material will you use to accomplish that design goal? KK: For us the borders between private residence and public spaces are ambiguous. For both building types the most important thing is intimate space. The difference is how to control the privacy? Basically to create the human scale as an intimacy is a goal of our practice and the key word for this design is a village. In a village both privacy and the public should go together. In this design the control of that privacy is accomplished by a delicate screen and the word Koshi (traditional Japanese window) is key term in controlling the delicacy and privacy. For our design we are adapting a new Koshi design that will face the new courtyard. The density of the Koshi varies depending on the program. Some parts of the Koshi are dense and other parts are not so dense and the density is actually very random and that is our new design. The Japanese Garden will be our first use of it. For the Lotus House the screen design of hanging stone is consistent but here the Koshi for the new facade, it varies. 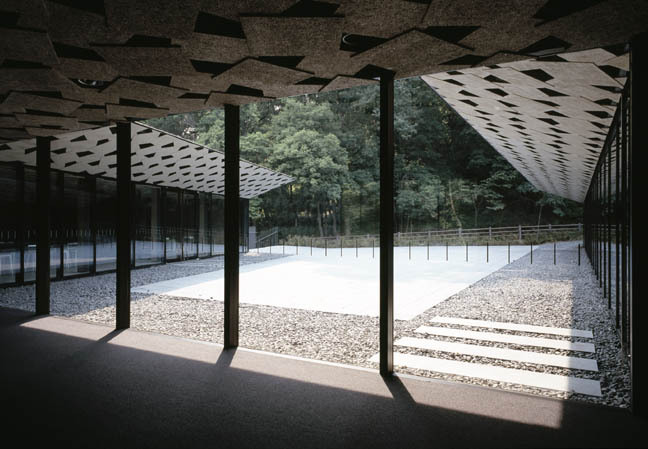 JJ: Discussing exhibition spaces and interiors, the recent Marseilles museum project has a more consistent facade like you describe in the Lotus house but in another project the Asakusa Visitor Center (which is a stacked village of houses) there is an exhibition space with metal mesh screening. Both are very different, will the Portland project use the same Koshi for the exhibition space to give intimacy to the objects on dsplay? 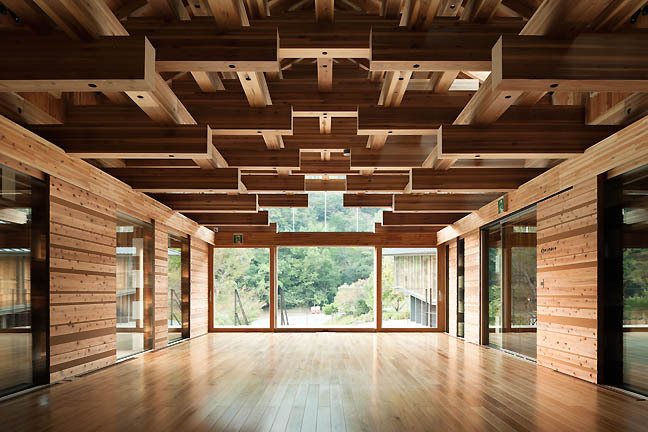 KK: Yes, the same Koshi but also the roof is another important vocabulary in the design. The roof creates an intimate space because it is inclined to the courtyard which is important for the site because it develops a human scale. On the hillside, because of the inclination we can have a bigger space. 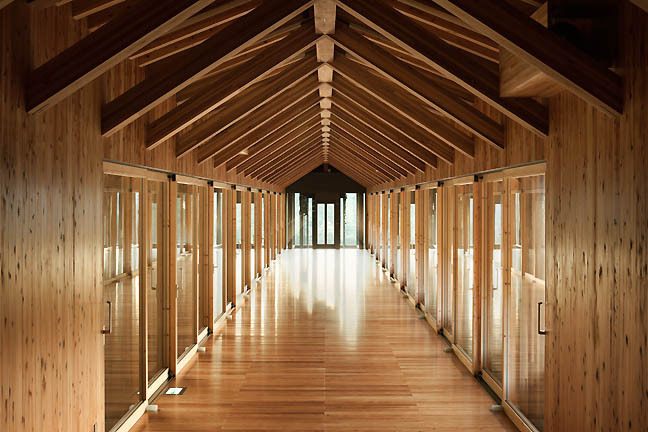 Through the use of these roofs as a combination we can create a sense of intimacy but the bigger space is designed to some be used as an exhibition space but also those greater inclinations can introduce natural light into the interiors by the use of reflection. 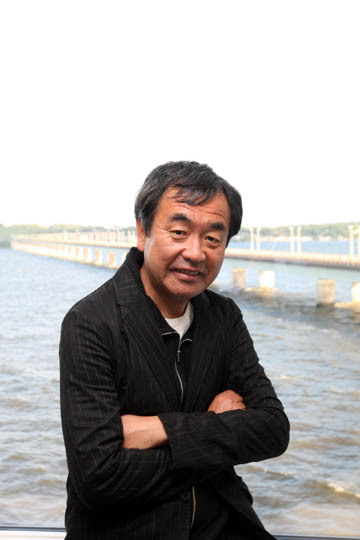 Do you know Junichiro Tanazaki's aesthetics book? 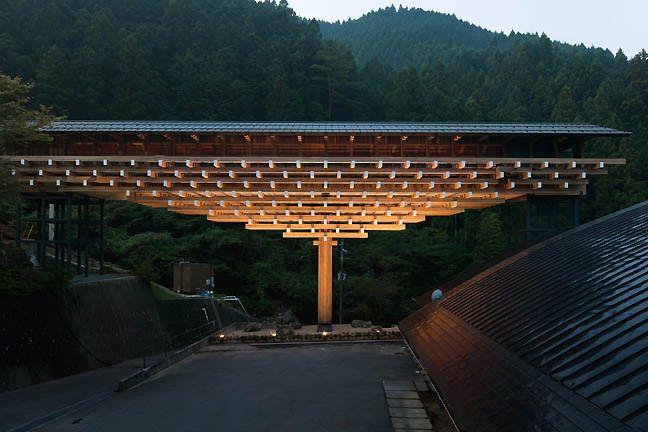 Junichiro Tanazaki's In Praise of Shadows is a book that discusses the incline of the roof as a means of creating reflections down into the space and we try to use the same thing for this project's design. JJ: That should be very interesting, especially since it will recall the verticality of the trees which are always throwing shadows by virtue of being what they are. I wanted to ask you specifically about you interconnecting spaces because you are known for them but a lot of architects don't pay a lot of attention to hallways, courtyards etc. Why are these connective spaces so important in all of your projects? KK: In the beginning of the Twentieth Century the modernists achieved inter-connective space by use of transparent glass. The difference between them and us is our use of the screen and the inclined roof. In their time a lot of their efforts went into trying to deny or avoid the inclined roof as a theme of that period. In that period they couldn't use the inclined roof or eaves. For them the eaves and the inclined roof was a kind of crime but now we have use of those vocabularies from history because our time is very free. Now we can do anything. 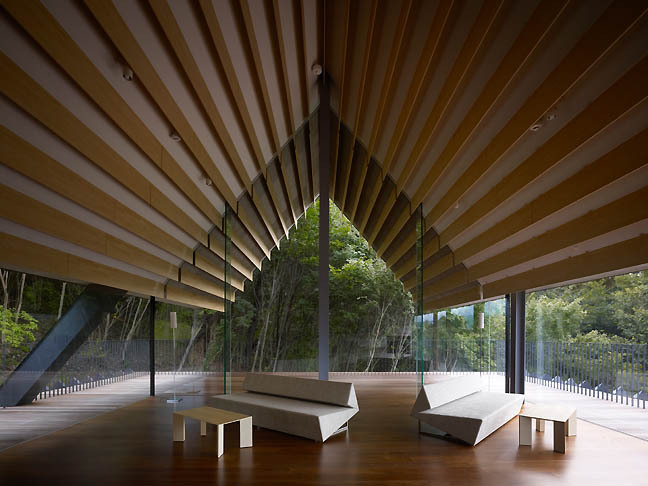 The use of the screen was not appropriate for the modernist but now through louvers, Hisashi eaves and screens as well as the use of materiality. For Modernists materiality was a kind of risky thing because abstraction was a theme of that time. Now because of this freedom, the interconnected space can be stepped up because we have the use of those vocabularies. JJ: True, all of those open plans kept those very distinct interstitial moments from occurring. That's what is so exciting about your project in Portland... it is like you are designing an entirely new neighborhood up there in the Tualatin Mountains and Portland does love its neighborhoods. What is special is it invites the city and the world to experience the Japanese garden and its very specific Portland site qualities on an intimate scale. Was there any other challenging aspect of the project that I haven't touched upon and you would like to talk about? BB: You've really touched on the most crucial aspect of the project becoming a village and neighborhood but we have reached out in working with the neighbors literally, and making certain they understand the project. Those neighbors are really quite important to the process in the same way all of Portland has been. KK: Another thing is the way the education about the garden functions. The philosophy of Portland's Japanese Garden is to share or transfer Japanese wisdom about gardens and other aesthetics to America. Because the problem with Japanese gardens in Japan is they are beautiful as a work but they have no idea as to how to transfer the technique to the people as a kind of exclusive artwork. But now some Japanese cultures are disappearing because they have no education system. They have a technique but the wisdom is only for them. But the Japanese Garden in Portland people come to learn something from the garden and the garden exists to transfer the wisdom and technique to the people. This idea is very necessary for Japanese culture because it is also a combination of a democratic political system and education as well as a history and traditions. So if we can combine both we can open up a new age. JJ: It's a very exciting prospect as Japanese Gardens seem to be at a bit of crossroads similar to what Jazz faced after the 60's. The question was whether to remain a kind of conservation project where the art form is treated in a purely traditional manner, a kind of mummified art form. Whereas someone like Miles Davis, I know you are inspired by his music... knew that Jazz had to branch out and adapt to new opportunities to remain a living art form with fresh new practitioners.